New York Yankees manager Joe Girardi said a fan was "rightfully" ejected from Yankee Stadium during one of Gary Sanchez's at-bats in Tuesday night's 6-1 home win over the Tampa Bay Rays. Girardi said the umpire ejected the fan sitting behind home plate for "yelling out location for one or two pitches when Gary was up." Sanchez was batting with a full count against Austin Pruitt in the eighth inning when plate umpire Dan Bellino walked to the backstop and spoke to a member of the team's security staff, directing that the fan be removed. Bellino then walked toward second base and conferred with crew chief Jerry Layne. Play resumed after a break of about 90 seconds. Sanchez fouled off a pitch, then hit a bloop RBI single. Ramos said the spectator's shouts were accurate. Both managers praised the ejection. "Rightfully so. That shouldn't happen," Girardi said. Said Tampa Bay manager Kevin Cash: "The Yankees handled it really well and got him out of there." Asked if he was aware of anyone in the Yankee Stadium stands yelling out pitch locations before the umpire alerted him to it, Girardi said, "I heard it one or two pitches." He added that, "The first time I heard it, I didn't think much of it, and the second time I heard it, and that's when the umpire went back there." 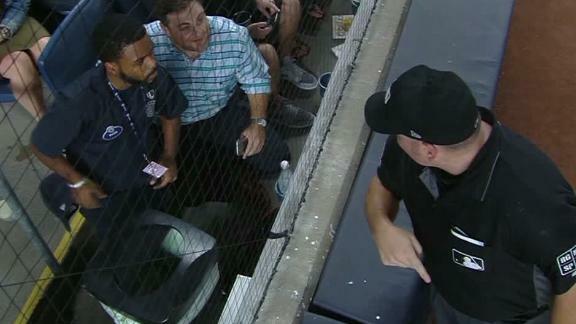 "That shouldn't happen, and they were removed from the park," Girardi said in reference to the fan's ejection. Girardi said he had seen something similar happen before, but not at Yankee Stadium. Said Girardi: "I've heard it at other places." During Gary Sanchez's at-bat during the eighth inning, the umpire has a fan removed from the game for yelling out pitch locations. Joe Giradi clarifies what happened after the game.